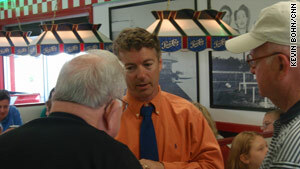 Republican Senate candidate Rand Paul talks to potential voters at a diner in Lexington, Kentucky. Washington (CNN) -- Rand Paul backed out of his Sunday morning talk show appearance, but that didn't stop people from talking about him. Paul, the Tea Party-backed eye doctor who won Kentucky's Republican Senate primary last week, cited exhaustion as well as a desire to put behind him controversy over his comments on the Civil Rights Act in deciding against a previously scheduled appearance on NBC's "Meet the Press," according to host David Gregory. Gregory also said Paul's spokesman issued a statement saying Paul wanted to avoid the "liberal bias" of the media. Paul, the son of former Republican presidential candidate Rep. Ron Paul of Texas, has said he opposes racism but believes the Civil Rights Act of 1964 was too expansive in dictating that privately-owned businesses must serve all customers. He later said he supported the landmark legislation but continued to question what he called the excessive role of government in the lives of U.S. citizens. Most fellow Republicans characterized the issue as a mistake by a rookie politician, but Republican National Committee Chairman Michael Steele, who is African-American and is trying to broaden the party's support among minorities, said it involved a personal philosophy that "got in the way of reality." "I think his philosophy is misplaced in these times. I don't think it's where the country is right now," Steele said on "FOX News Sunday." "The country litigated the issue of separate but equal. The country litigated the rights of minority people in this country to access the enterprise -- free enterprise system, and accommodation and all of that. And that was crystallized in the Civil Rights Act and the Voting Rights Act of '64." Others agreed Paul erred, but noted he quickly clarified his support for the landmark civil rights legislation. "His comments about the Civil Rights Act were unfortunate, and he's since then said that he would've voted for" it, Minnesota Gov. Tim Pawlenty said on the CNN program "State of the Union." Tennessee's veteran Republican Sen. Lamar Alexander used a baseball analogy, telling the CBS program "Face the Nation" that "even a very good baseball player sometimes has a hard time going from Triple-A to the Major Leagues." "He made a mistake there," Alexander said. Sen. John Cornyn of Texas, the Senate Republican campaign chairman, acknowledged on the NBC program that Paul's inexperience showed. "You see novice candidates occasionally stumble on questions," Cornyn said, adding that the issue of Paul's stance on the civil rights law was "a fair question." "What I heard him say is that he supports the Civil Rights Act," Cornyn said. "That should be the end of it." Former Alaska Gov. Sarah Palin, speaking on the FOX program, said Paul's situation was similar to her own interaction with the news media when she became the Republican vice presidential nominee in 2008. "One thing that we can learn in this lesson that I have learned and Rand Paul is learning now is: Don't assume that you can engage in a hypothetical discussion about constitutional impacts with a reporter or a media personality who has an agenda, who may be prejudiced before they even get into the interview in regards to what your answer may be -- and then the opportunity that they seize to get you," Palin said. "You know, they're looking for that 'gotcha' moment." On the same program, Democratic National Committee Chairman Tim Kaine said Paul's statements were more than just showing his inexperience. "I think these statements were clearly wrong," Kaine said. "They reflect lifelong views, and ... I hope that members of the Republican Party will step up and condemn those statements and say they're wrong." November general election to fill the seat being vacated by retiring Republican Sen. Jim Bunning. On the same program, Steele noted Paul had reiterated his support for "pushing civil rights forward, as opposed to going backwards." "Any attempt to look backwards is not in the best interest of our country certainly, and certainly not in the best interest of the party," Steele said. However, Kaine also cited another Paul statement last week in which the candidate said it was "un-American" for the Obama administration to come down so hard on oil giant BP regarding the Gulf of Mexico oil spill. "Rand Paul is wrong," Kaine said. "It isn't un-American to hold somebody accountable for a massive environmental disaster." Steele, however, said the Obama administration deserves the blame for failing to halt the underwater gusher. "The federal government should have stepped into this thing immediately to help make sure that the appropriate steps were being taken by BP [and] all federal agencies in support of the state government to try to get this thing cleaned up," Steele said. "And here we are almost a month and a half later and it's still spilling oil." On another political miscue -- the false claims by Connecticut Democratic Senate candidate Richard Blumenthal that he saw active military duty in Vietnam -- Democrats acknowledged that Blumenthal erred but noted the state's attorney general has regularly described his record accurately throughout his career. "Those statements were wrong, period," Kaine said on the ABC program. "They were wrong. And it was very important for him to acknowledge that and clear that up. Now, in his defense, he has given numerous speeches that are in the public record where he's talked extensively about his service, what he did, what he didn't do." Republicans, however, said Blumenthal showed he was willing to lie to voters, which they said would feed into the public anger against politics-as-usual. "At a time when the American people are clearly rebelling against the same-old, same-old in politicians, Blumenthal is not the kind of guy I think they want to send anywhere, let alone to Washington to serve at this time, so I think there is a big credibility gap here," Steele said on the same program. "You can't say, 'Well, you know, on the one instance, I lied to you, but on the other, since I made up for it by explaining why I lied to you.' It doesn't make sense to the American people." At the same time, Steele noted that in both the case of Blumenthal and Paul, "the people in Connecticut, just like the people in Kentucky, will have the final say and the ultimate say on these leaders."